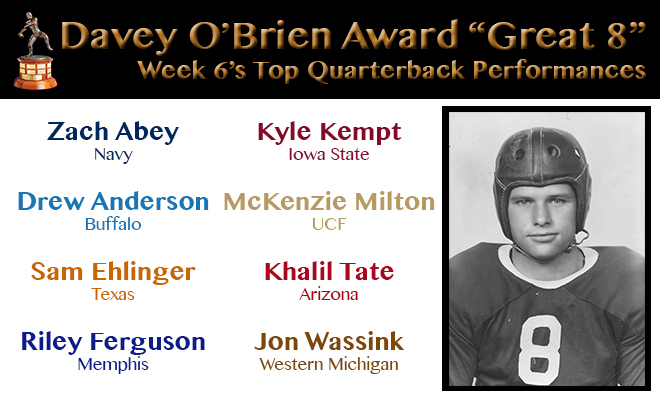 FORT WORTH, Texas (Oct. 9, 2017) – The Davey O’Brien National Quarterback Award’s “Great 8” performers for week six of the college football season combined to account for a total of 40 touchdowns (32 passing, seven rushing, one receiving) this weekend. 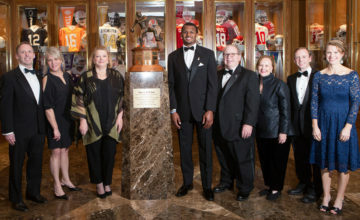 The eight honorees, as determined by voting from the award’s selection subcommittee, are: Zach Abey of Navy, Buffalo’s Drew Anderson, Sam Ehlinger of Texas, Memphis’ Riley Ferguson, Kyle Kempt of Iowa State, UCF’s McKenzie Milton, Khalil Tate of Arizona and Western Michigan’s Jon Wassink. 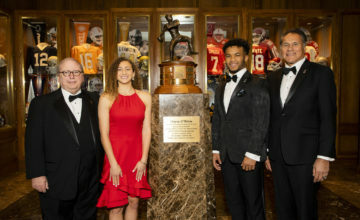 Abey appears on the list for the second straight week, while Ferguson is also being honored for the second time in 2017. Forty different quarterbacks have now earned the 48 total honors through the season’s first six weeks. Topped the 200-yard rushing mark (214) with two rushing touchdowns, and had a pair of passing scores, including the game winner with 15 seconds left in a 48-45 rivalry win over Air Force. Drew Anderson, Buffalo, Jr., 6-5, 230, Orinda, Calif. 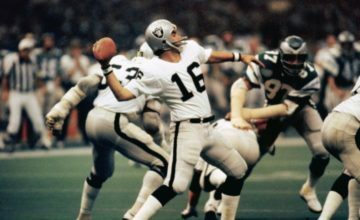 Threw for a MAC-record 597 yards (35-of-61), matched a league record with seven touchdown passes and added a rushing score in a seven-overtime loss (71-68) to Western Michigan. Amassed 487 total yards (380 passing, 107 rushing), the third most in school history, with two passing touchdowns in a 40-34 double-overtime victory over Kansas State. Riley Ferguson, Memphis, Sr., 6-4, 210, Matthews, N.C. Threw seven touchdown passes, tying a school and conference record, and completed 34-of-48 attempts for 431 yards in a 70-31 win over UConn. Led the Cyclones to a 38-31 upset at No. 3 Oklahoma, ending an 18-game series streak, by completing 18 of 24 passes for 343 yards and three touchdowns in his first career start. Threw more touchdown passes (5) than incompletions (3), going 16-for-19 for 374 yards (19.7 per attempt) in a weather-shortened 51-23 win over Cincinnati. Khalil Tate, Arizona, So., 6-4, 215, Inglewood, Calif.
Set an NCAA FBS record for rushing yards by a quarterback (327) on just 14 carries (four touchdowns) and was 12-of-13 passing for 154 yards and a score in a 45-42 victory over Colorado. Jon Wassink, Western Michigan, So., 6-2, 205, Grand Rapids, Mich. Accounted for six touchdowns (five passing, one receiving) and 295 total yards (256 passing, 26 rushing, 13 receiving) in a 71-68 seven-overtime win over Buffalo.